‘There are 70 minutes to the end of the world. Dragon’s Domain Records, to be distributed through buysoundtrax.com, presents the soundtrack release of MIRACLE MILE, featuring music composed by Tangerine Dream (SORCERER, THIEF, RISKY BUSINESS) for the 1989 thriller written and directed by Steve De Jarnatt (CHERRY 2000), starring Anthony Edwards, Mare Winningham, Mykelti Williams, John Agar, Lou Hancock, Kelly Jo Minter, Kurt Fuller, Denise Crosby, Robert DoQui, O-Lan Jones, Claude Earl Jones, Earl Boen, Diane Delano, Brian Thompson, Jenette Goldstein and Raphael Sbarge. MIRACLE MILE is presented on two CDs, newly remastered, with previously unreleased music and exclusive liner notes. MIRACLE MILE begins as a sweet love story between Harry (Edwards) and Julie (Winningham) and then suddenly takes a left turn when Harry answers a ringing payphone outside of his favorite coffee shop. The distraught voice on the other end of the line blurts out that he’s in a missile silo and the launch codes for the missiles have been entered. The bombs launching in retaliation from the other side will hit in about 70 minutes. When word gets out, gradually at first and then countrywide, panic sets in and Harry must seek a means to get out of town, but first he needs to find Julie. The film becomes a race against time to reunite the couple and find a way to reach safety before it’s too late. MIRACLE MILE was the product of Cold War-instigated fears that writer/director Steve De Jarnatt had grown up with during the late ‘50s/early ‘60s. Those nightmares germinated in his imagination and eventually coalesced into the story told in MIRACE MILE. Unlike other films that took nuclear holocaust as their starting point to focus on a story of post-apocalyptic survival and recovery, De Jarnatt was more interested in exploring what would happen in the hours just before the missiles landed and how people would be affected. The Miracle Mile is a retail district in central Los Angeles located on a 1.5-mile stretch of Wilshire Blvd. Initially developed in 1928, the Mile was home to trendy shops, the historic La Brea Tar Pits, Hancock Park, and an impressive assortment of historic Art Deco buildings. By the 1980s it had become fairly run down, with some of its most cherished structures giving way to apartment complexes; but an influx of important museums and office centers injected new life into the district giving it a renewed cultural interest that would provide a unique background for the film. Setting the film on L.A.’s real Miracle Mile was always a part of De Jarnatt’s central concept. When he was writing the screenplay for MIRACLE MILE, De Jarnatt was listening repeatedly to the pioneering German electronica band Tangerine Dream’s first film score, SORCERER (1977), impressed by its progressive mix of rhythm, drones, and minimalism. By 1989, Tangerine Dream consisted of founder Edgar Froese and classically trained keyboardist Paul Haslinger, who had joined the band in 1985, replacing Johannes Schmoelling. Founding member Christopher Franke had left the band in 1987, leaving Tangerine Dream as a duo when they were invited to score MIRACLE MILE. Prior to 1988, most of the band’s film scores were composed and recorded in founding member Christopher Franke’s Berlin studio. But with Franke’s departure, they relocated to Froese’s studio in the Viennese countryside of Austria. During the composing process, De Jarnatt flew to Vienna to work with the duo in Froese’s studio working with the duo to refine the score. From the moment the film begins to play out in real time, the beat of the music creates through its insistent drive an almost subliminal but palpable tension, increasing in exigency as the time runs down. MIRACLE MILE was originally released on compact disc in 1989 on Peter Baumann’s Private Music label nearly 30 years ago. 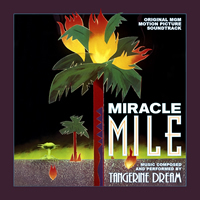 Dragon’s Domain Records is excited to bring MIRACLE MILE back into the marketplace on 2 CDs, newly remastered by Digital Outland and including previously unreleased music. The booklet includes exclusive liner notes written by author Randall Larson, with the participation of composer Paul Haslinger and writer/director Steve De Jarnatt. The original soundtrack cues on Disc 1 represent the score as delivered by Tangerine Dream to the director, essentially as heard in the film’s mix. These tracks have never been released commercially before. Disc 2 contains the original album version, which is distinctly different in tone and texture from the actual score as heard in the movie. MIRACLE MILE is a limited edition release of 1000 units. AUTOGRAPHED COPIES ARE NOW SOLD OUT.